Tenzin Tzela, Programme Director of the Student for a Free Tibet organization has expressed his concern about the fact that its organization has to represent Tibet working from abroad. She claimed that it is scary that sometimes they are not aware of what is going on in Tibet. She pointed out the importance of raising funds to organize movements against the Chinese government, and highlighted that their dream is to be able to go back to their homeland and be allowed to work for their independence from there. Dharamsala — Tenzin Tzelha, the program director of Student for a Free Tibet India, spoke about Tibet independence issue and the final goal of SFT: to make sure that the Tibetan people can go back to their motherland, Tibet as soon as possible. SFT is an international student organization supporting Tibet independence. The most important movement they organized recently was a series of demonstration against the injustice of Teznin Delek Rinpoche's death in prison. The initial information of Rinpoche's death came from SFT. The four main offices in New York, Canada, London, and India coordinated with each other and organized demonstrations with grass roots and chapters around the world. They have been working on the release of Tenzin Delek Rinpoche for 13 years, and were shocked when the Rinpoche's death was confirmed. The case had been highlighted and become global now since the organized protests and the actions. On the operation of SFT as a cross country organization, Tenzin Tzelha responded, "Friends working together." 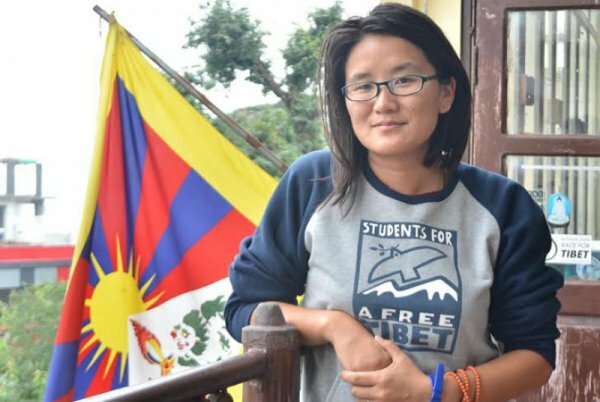 Despite the cohesive force of SFT, Tenzin Tzelha expressed her concern on the controversy of representing Tibetan people as an organization working out of Tibet. "Sometimes, we claim that we know what is happening in Tibet, but sometimes I think we don't. That's the scariest thing now," she said. "When we think we're amplifying the voice of the voiceless, do we know what the voiceless is trying to say? Sometimes I feel like I represent people in Tibet when I speak publicly, and when I get interviewed. And I don't want to misrepresent that. I want to say what they actually think," she added. That is why SFT is always careful with the information source. Tzelha also talked with people in Dharamsala who got out from Tibet to know the voice inside the land. Tzelha also mentioned that more resource is needed to organize more movements. They 're fortunate to have merchandise stores which supports the finance of the organization, however they still need more budget on the continuing new movements considering the long-term protest against Chinese government. "Maybe, we should think of a new way of fund raising, maybe a big one," said Tzelha. SFT is doing whatever they can to reach the final goal: to go home.